Are Nuclear Plants Safe? Environmentalists Are Split Some environmental groups say the nuclear disaster in Japan is a wake-up call and they would not support building new U.S. nuclear plants. Others say that nuclear power is still one of the safest technologies invented. But both sides agree that the priority should be to examine existing U.S. nuclear plants for safety risks. A magnitude 9.0 quake rocked Japan, triggered a tsunami and set off a race to cool nuclear reactors. 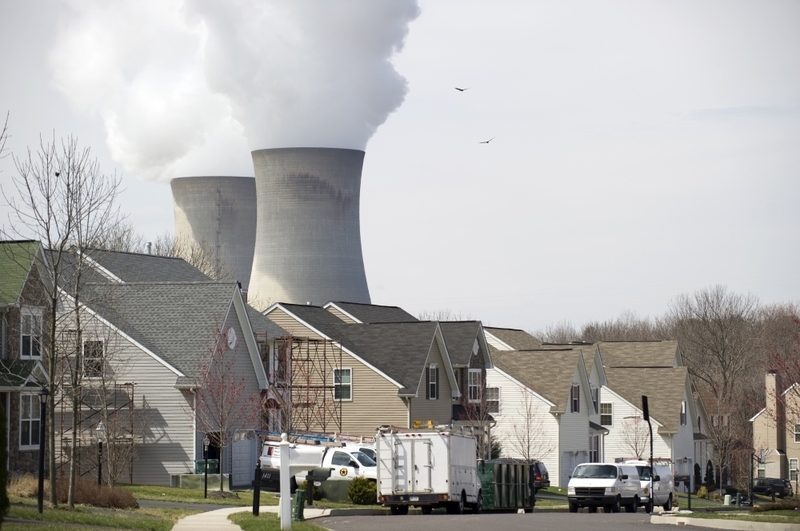 Cooling towers from the Limerick Generating Station, a nuclear power plant in Pottstown, Pa., sit near a neighborhood. Environmentalists agree that in light of Japan's nuclear crisis, the U.S. should examine existing nuclear plants for safety risks. The nuclear disaster in Japan comes at a time when some environmental groups had softened their positions against nuclear power. A few prominent environmentalists had even embraced nuclear energy as a way to fight climate change. But will the latest nuclear crisis bring them back to their "no nukes" roots? Forty years ago, Patrick Moore helped found Greenpeace as an anti-nuclear group. Ten years ago, after he left Greenpeace, he had a change of heart. Now he's a paid ambassador for the nuclear industry. He says the nuclear crisis in Japan has not made him reconsider his support for nuclear power. "Even including this accident, nuclear power has been one of the safest technologies we have invented," Moore says. In the United States, for example — 104 nuclear reactors operating now for 50 years — no member of the public has ever been harmed by them. You can't say that about oil or gas or coal. He says nuclear plants can produce dependable power 24-7 and don't produce greenhouse gases, so they can replace the coal-fired power plants that spew so much climate change pollution. And, Moore says, they have a great safety record compared with other sources of electricity. "In the United States, for example — 104 nuclear reactors operating now for 50 years — no member of the public has ever been harmed by them," he says. "You can't say that about oil or gas or coal." Moore is the rare environmentalist who has actually become an advocate for nuclear power. But in recent years, even some leading environmental groups had muted their opposition to nuclear power — or dropped it. "Prior to this disaster in Japan, we were interested — as a lot of people were — as to whether or not an energy package could be assembled that would potentially include some nuclear power incentives," says Elgie Holstein, senior director for strategic planning at the Environmental Defense Fund. That was seen as a way to make a climate change bill palatable to a broader group in Congress. President Obama supports nuclear power, as do many Republicans. Holstein says his group still thinks the strategy could work. "We're still interested in whether or not such a package can be put together," he says. But Holstein concedes that effort should be put on hold. Experts first need to figure out what went wrong in Japan and whether safety standards in the U.S. should be updated. For other environmental groups, the nuclear disaster in Japan is a wake-up call. The Sierra Club declares on its website that the group has opposed nuclear power for more than three decades. But the group supported the climate change bill that passed the House two years ago, which included subsidies for a next generation of nuclear power plants. Sierra Club Executive Director Michael Brune says that will not happen again. "It would be hard to stomach any further support for additional nuclear power plants in the country," he says. We've always believed that it's an inherently dangerous technology that should be phased out and replaced. "Making the problem worse by throwing taxpayer dollars at new nuclear plants would be something that the Sierra Club would definitely not support," he adds. "We would oppose it vigorously." Brune says his group will make it a priority to examine existing U.S. nuclear plants for safety risks — and make sure the public is being protected. Greenpeace is one group that never softened its opposition to nuclear plants. "We've always believed that it's an inherently dangerous technology that should be phased out and replaced," says Jim Riccio, a nuclear policy analyst for Greenpeace USA. "And there are many cheaper, easier and less dangerous ways to generate electricity that don't threaten our families, homes and communities." In recent years, public opinion polls had shown growing support for building more nuclear plants in the U.S., with as many as 60 percent of Americans saying they were in favor of them. But since the crisis in Japan, polls show support has shrunk to closer to 40 percent.